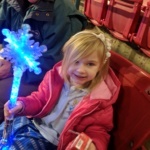 Yesterday, my children and I had the opportunity to experience the magic that is Disney on Ice. It was a very special day for us and the kids were so excited even before we got there. 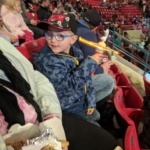 For anyone who is unfamiliar with Disney on Ice, it is a Disney skating show that showcases different Disney characters in an exciting production full of lights, music, and their favorite Disney characters. True to Disney form, the production value was great. Be warned, if you decide to go, the souvenirs that they sell there are super expensive. Which is quite in the style of the Disney band. So, if you want to get something light up for your child and you are on a budget, maybe bring something with you. The same goes for the stuffed animals they sell. When we got to the event, there were lots of kids that were dressed up for the event. We saw lots of princesses wandering around, and lots of people were decked out in Disney gear. My family was no exception. I had hoped to let my daughters wear a new Rapunzel dress that they had gotten, but it was so big that I just dressed them in blue dresses and told them they were Cinderella dresses. As they are three, they believed me and everyone was happy. My son had a Mickey Mouse hat on with his Mickey jacket, which he absolutely loved. This year’s Disney on Ice featured stories from Cocoa, Beauty and the Beast, Cinderella, Rapunzel, Frozen, and Moana. Also, there was Mickey, Minnie, Donald, and Goofy. It wouldn’t be a Disney show without them! 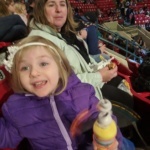 I don’t want to ruin the show for everyone, but the special effects in the show really made the experience magical for the kids, and seeing their favorite characters out there dancing on the ice was really special. It was so magical for my kids, which made it magical for me. While the experience definitely isn’t cheap, if you can afford the tickets, it is definitely worth a visit the next time they come to your city!